Dr. Matthew Gillis publishes new book on religion and the Carolingian Empire. 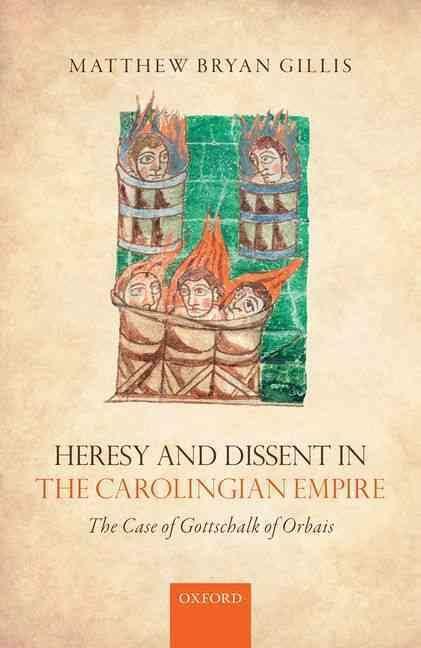 Congratulations to Dr. Matthew Gillis whose book, Heresy and Dissent in the Carolingian Empire: The Case of Gottschalk of Orbais, has just been published by Oxford University Press. While the British version appeared today, American audiences will have to wait until April 16 to get their copies. Heresy and Dissent in the Carolingian Empire recounts the history of an exceptional ninth-century religious outlaw, Gottschalk of Orbais. Frankish Christianity required obedience to ecclesiastical superiors, voluntary participation in reform, and the belief that salvation was possible for all baptized believers. Yet Gottschalk-a mere priest-developed a controversial, Augustinian-based theology of predestination, claiming that only divine election through grace enabled eternal life. Gottschalk preached to Christians within the Frankish empire-including bishops-and non-Christians beyond its borders, scandalously demanding they confess his doctrine or be revealed as wicked reprobates. Even after his condemnations for heresy in the late 840s, Gottschalk continued his activities from prison thanks to monks who smuggled his pamphlets to a subterranean community of supporters. This study reconstructs the career of the Carolingian Empire’s foremost religious dissenter in order to imagine that empire from the perspective of someone who worked to subvert its most fundamental beliefs. Examining the surviving evidence (including his own writings), Matthew Gillis analyzes Gottschalk’s literary and spiritual self-representations, his modes of argument, his prophetic claims to martyrdom and miraculous powers, and his shocking defiance to bishops as strategies for influencing contemporaries in changing political circumstances. In the larger history of medieval heresy and dissent, Gottschalk’s case reveals how the Carolingian Empire preserved order within the church through coercive reform. The hierarchy compelled Christians to accept correction of perceived sins and errors, while punishing as sources of spiritual corruption those rare dissenters who resisted its authority.